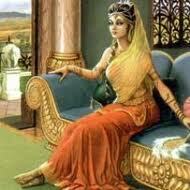 Draupadi sat in a corner brooding. It was exactly a month after the bloody war of Kurushektra and although she was in the victorious camp, the pandavas and their share of loses too. She ran her fingers through her hair, reminiscing about the spate of events. That was it. Her hair! They had turned into a mass of dry and rough stack of hay. She had bravely taken the vow on that fateful day when she was dragged by her lustrous hair into the packed court of king Drishrashtra to avenge the disgrace that her hair suffered with the blood of Dushasana. Until then she vowed never to tie them. Years of neglect, dust and environmental harshness had reduced the once luxurious, shining and silky mane to a pitiable condition. She decides to discuss this issue with her husbands. After all, they were all mighty warriors and repectable kings in their own right. Will they not be able to find a solution to a problem so mere for their reputation? The next day, she goes into Yudhistra's chamber. She finds him in a contrite and pensive mood, something that had become a regularity with him since the end of the war. After exchanging pleasantries, Draupadi places her problem before Yudhistra. "Oh, Queen! I expected better of you. Of all the problems, you are worried about something so trivial? I have other important issues to be sorted out. I suggest you get a nice massage with a good hair oil." Draupadi was miffed and angered by the diffident and cold response. Hair-oil, huh? didn't she already know these solutions? Probably, it was foolish of her to expect empathy from her ever just and citizen-loving husband of hers. Blinded by fury, she stomped out of the chamber only to bump into Nakul. Nakul looked at her state in bewilderment and asked her the reason for her distress. As Draupadi recounted the course of events, Nakul was unable to hide the smirk on his face. A handsome man himself, he felt amused at Draupadi's predicament. Sharp as she was, Draupadi was quick to catch the faint smile and chides him adequately. Nakul, though a little vain, was a wise man. He knew better than to incur the wrath of an insulted woman. He was visibly chastened and wisely asked for forgiveness. Though, he was unable to provide any solution, he used his astrological prowess to pacify and mollify the hurt Queen. "Oh, Draupadi, fret not. Your problems are to end soon. The glory and respect that your hair is worthy of will be restored very soon. Help is at the doors." Draupadi calms down on hearing this and her spirits are lifted a little even. She goes back to her chamber to cool her heels. Discouraged by the responses of Nakul and Yudhistra, she goes back into a morose state as she is no closer to finding a solution. Arjuna would have been sympathetic and resourceful but as luck would have it he was away on an tour to the earth on an errand by friend, philosopher and guide, Krishna. Bheema would move mountains for her but again he was preoccupied with the cooking challenge that the neighbouring state had thrown. "Is there no one who can understand my misery? No one who'd not belittle my problem and help me find a solution? ", thinks Draupadi aloud. "Oh, Sakhi! how could you forget me? I, who have stood by you in all your difficult times, did it not occur to you to think of me or am I not worthy of it?" , asks a sweet voice that is mixed with mischief and slyness. Draupadi turns to see the blue cowherd, dressed in his trademark yellow dhoti and peacock feather tucked in his crown. His twinkling eyes giving away the masked seriousness in his question. Draupadi is about to offer her apologies and explain herself when Arjuna enters in with a packet tucked in his arms. He smiles and gives the packet to Draupadi, who is surprised and confused with the turn of events. 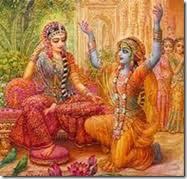 Her mind running with questions of how did Arjuna come back early, How come krishna timed his arrival with Arjuna? She needn't have worried with Krishna around. As though, reading her mind, he steps in to answer her questions. "Sakhi, I knew the cause for your worry and hence I had sent Arjuna to Earth to procure the solution. This packet contains the whole range of products by a company called Dove. They are experts in providing solutions to all kinds of hair problems. My ardent devotees on earth testify to their claims, so be assured of positive results." Draupadi's joy knew no bounds as she had at found the miracle product -Dove that was to put an end to all her hair problems. She couldn't thank Krishna and Arjuna enough. Within a couple of weeks' use, she could see a visible improvement in the texture and health of her hair. In a couple of months, her mane was restored to their former glory and shine, one befitting a queen of her stature. hehehehehe.... some predicament for Draupadi! :) you SHOULD win with this one! it's that brilliant! Good one Uma .. Am sure yours must have been the most unique story amongst all the entries :) Very good thinking ..
well, not sure about most unique, Aarthy. There are definitely better entries out there. As I told Purnima, am glad that my readers liked it. That's sufficient. Haaah....this story is sooo COOOL Uma!!!!! Bindu my dear friend...how have you been??? Very innovative, Uma! Wish you the best. You are surely going to win. Hey, Era!!! long time...how have you been?? Lovely Uma, super like! You have managed to convey so well that the hair problem occupied minds of our queens and kings even back then. Images of queens, princesses, citizens trying various oils, other potions for hair, trading secrets and know-hows, comes to mind. And asking boons for long lustrous hair!! Ha ha, imagine now for some reason I am going to think Mahabharata, Draupadi and Dove all at the same time!! hahaha..Dove and Draupadi will make a funny pair indeed. oh, it's there Uma, do check again! Thanks so much, Jas for the lovely compliment! Whatteee!! Loved it. Is there a place I can vote for it? So good, Uma! Hey, Archana..thanks a million bunch! am so glad you liked it.. When I started reading, I was like...wahts all this about Draupadi? Then I figured it was fiction. But I didn't see the "twist"at the end coming :) When does the contest end? I'll vote for u too! No wonder Draupadi continued to become immortal Panchali( one who has five husbands). Thank you Dove:) Lovely imagination , Uma and best wishes for the contest! :-) thanks a lot, Rahulji for the lovely comment and good wishes! Superbly written Uma...all the best for the competition! The narration was too good - simple and lucid. Very well narrated!! That Dove ending was quite funny and unexpected.. :D :D Best of luck for the contest!! haha..thanks, Divya! I liked the idea of the new poster girl..quite a revolutionary icon, don't you think? Wow. This was innovative and interesting. Actually come to think of it, Dove and Draupadi together makes a lot of sense. Loved tge way you wrote this. Hahaha! Funny story! Makes me wonder if Draupadi really had hair problems cos of her oath....!!! Haha! Nice one Uma. I love writing fiction for contests. Puts me out of my comfort zone as we need to find a way to incorporate those links. You've done well. If it wasn't for the links at the end or the reference to 'hair' in the first para, it would be a greater take on the story. There have been many myths about Goddess Draupadi, many are mis-interpretations, base-less. She is considered a grama devetha and kula devatha for many people. There are many shrines for Goddess Draupadi, spread in Andhra Pradesh, Tamil Nadu and Karnataka. One of the shrines, where She is a Grama-Devatha and Kula-Devatha to many, is located in one of the small villages of Tamil Nadu. Draupadi Amman Thunai - May Her blessing be always on you all!! Keeping quiet is an art..